Last night’s dinner: Delicious and a perfect way to take advantage of those late season tomatoes. The recipe calls for two pork tenderloins. I used only one, halved the spice rub, but made the full amount of sauce. Best to make the sauce before cooking the meat. The extra can be frozen for future use on pasta. If you don’t want to grill, see below for stove-top and oven instructions. Prepare grill for cooking over medium hot charcoal (moderate heat for gas). Meanwhile, whisk together 1 tablespoon oil, 1/4 teaspoon cayenne and 1/2 teaspoon each of cumin, cinnamon and salt in a large shallow bowl. Pat pork dry and add to spiced oil in bowl, turning to coat. Grill tenderloins on lightly oiled grill rack. Cover only if using a gas grill and turn over occasionally until thermometer inserted into thickest end of meat registers 150 degree F, about 15 minutes. 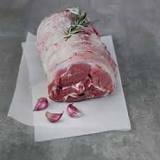 Transfer to cutting board and tent loosely with foil and let stand 10 minutes before slicing. Meat will continue to cook and temperature will rise. 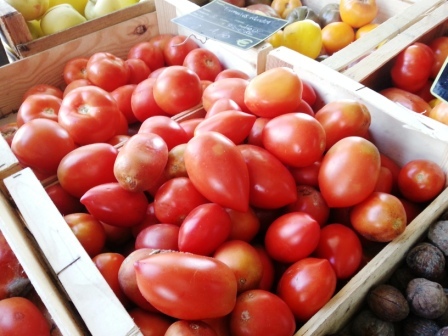 TOMATO SAUCE: Cook garlic in remaining 2 tablespoons oil in a large heavy skillet over moderate heat, stirring occasionally until pale golden, 1 to 2 minutes. Add tomatoes with their juices, remaining 1/8 teaspoon cayenne, and 1/4 teaspoon each of cumin, cinnamon and salt. Briskly simmer until sauce is slightly thickened, abut 10 minutes. 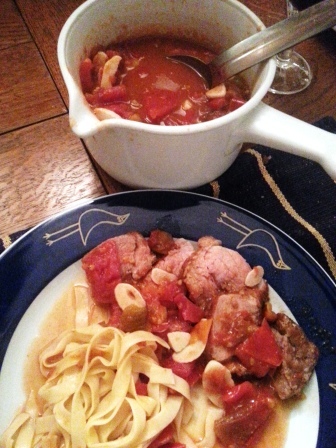 Slice pork and serve with sauce and pasta of your choice. If you don’t want to grill, the pork can be cooked in a hot, lightly oiled grill pan over moderately high heat, turning until well browned, about 10 minutes, then roasted in a pre-heated oven (400 degrees F) until thermometer registers 150 degrees F, about 10 minutes. Let stand as explained above. Like my recipes? Let me know. I’d love to get feedback. Leave a Reply below.